For many, a loft simply provides storage space, but converting it into an extra room can have a bigger impact on your home than you might think. Paul Wherton, from roof window manufacturers Roof Windows 4 You, tells us the main benefits of adding a loft conversion to your property. A loft conversion is so much more than a way to gain extra space in your home: it’s also a great way to invest in your property. Find out more about the benefits of converting your loft into a useable space below. One of the biggest advantages of a loft conversion is its effect on the value of your home. Those that incorporate a bedroom and bathroom can add up to 21% to a property’s value, according to a report published by Nationwide. Lofts can be one of the least energy efficient parts of the home. Around 25% of the heat produced in our houses will escape through the roof without proper insulation, according to the Green Age. As part of the conversion process, you can incorporate insulation into the roof to make it more energy efficient, and therefore reduce your carbon footprint and save money on your energy bills. An energy efficient home is also more attractive to house buyers. The most obvious benefit of a loft conversion is that it takes dead space in your home and transforms it into useable space. You can turn your extra room into another bedroom or be creative and turn it into a playroom for the kids or an office space for you. Don’t need the extra space? A spare bedroom can be rented out to guests or lodgers, meaning you can enjoy additional income and make a profit from it in the long run. Converting your loft gives you the option to add roof windows, which let in more natural light without being overshadowed by buildings and trees. Natural light has many benefits, including improved sleep and improved mental and physical health. It also reduces eye strain and headaches, which are often associated with fluorescent lighting. Talk to a trusted supplier when deciding which roof windows to get. You should discuss what kind would be best for your home and where they should be placed in order to let in as much natural light as possible. It might even be possible to incorporate design features that help spread the natural light to other parts of your home. Rooms in the attic naturally have a higher view out of their windows. This allows you to make the most of your location and enjoy views from your home that you couldn’t before. You can even decide on getting balcony roof windows installed, which fold out to give you room to stand. This is especially advantageous if you live somewhere scenic, but still benefits those in built-up areas, since the room is unlikely to be overlooked by neighbours. If you’re thinking of getting an extension, a loft conversion can be a more time-saving and cost-effective alternative for a number of reasons. Firstly, any related building work is not reliant on factors such as weather, which means the work can be scheduled for any time and you’re less likely to be affected by delays. It also requires less labour, simply because the external walls and roofing are already there. The job is fairly easy to carry out in just a matter of weeks and may only require some structural changes to support walls and floors, as well as the addition of roof windows. This means that any work being done in your loft causes relatively little disruption to your daily life, is finished more quickly, and is typically less expensive. Because you’re building inside your home, loft conversions rarely require planning permission to carry out, unless any alterations are being made beyond certain legal limits (Planning Portal). Plus, you won’t have to sacrifice any existing outdoor space. A loft conversion is also a more practical alternative if you’re considering moving home for more space, since they’re much easier, quicker and cheaper. 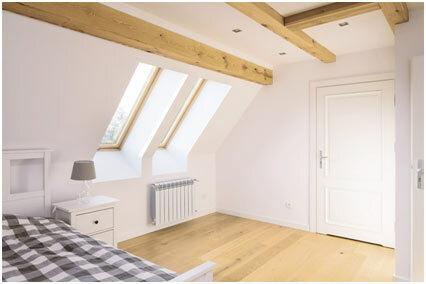 Converting your loft provides some great benefits for your home. By adding extra room, introducing more natural light, providing great views and saving you money in the long run, you can significantly increase the value of your property. You’ll be happier in your newly converted home, and future house hunters will be more attracted to it too.